The artist; probably a gift 1964 to David Bourdon [1934-1998], New York; his estate; purchased 1999 by (Virginia Green, New York); private collection; (Hackett-Freedman Gallery, San Francisco); purchased 12 June 2006 by NGA. Letter, 16 April 2013, Les Levine (executor of Bourdon's estate) to the NGA, and notes from a telephone conversation, 21 January 2010, between NGA staff and Frances Beatty; both in NGA curatorial files. An Exhibition of the Letters of Ray Johnson, North Carolina Museum of Art, Raleigh, 1976, selected envelopes and their contents, no. 18 (number assigned to the lender, David Bourdon), repros. More Works by Ray Johnson, 1951-1991, Goldie Paley Gallery, Moore College of Art and Design, Philadelphia, 1991, unnumbered catalogue. 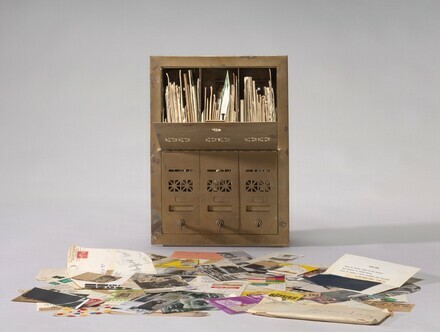 Ray Johnson: Correspondences, Whitney Museum of American Art, New York; Wexner Center for the Arts, Ohio State University, Columbus, 1999 (New York) and 2000 (Columbus), unnumbered catalogue, repro. Jess -- Word Pictures -- Ray Johnson: Paste-ups, Moticos and Assemblages 1951-1997, Art Basel, Hackett-Freedman Gallery booth, Miami Beach, 2005, unnumbered catalogue, repro.